When I think of the Airbus A380, I automatically think about it in the Emirates livery. No wonder, as with more than 100 planes Dubai’s airline has the by far largest fleet of A380s in the world. 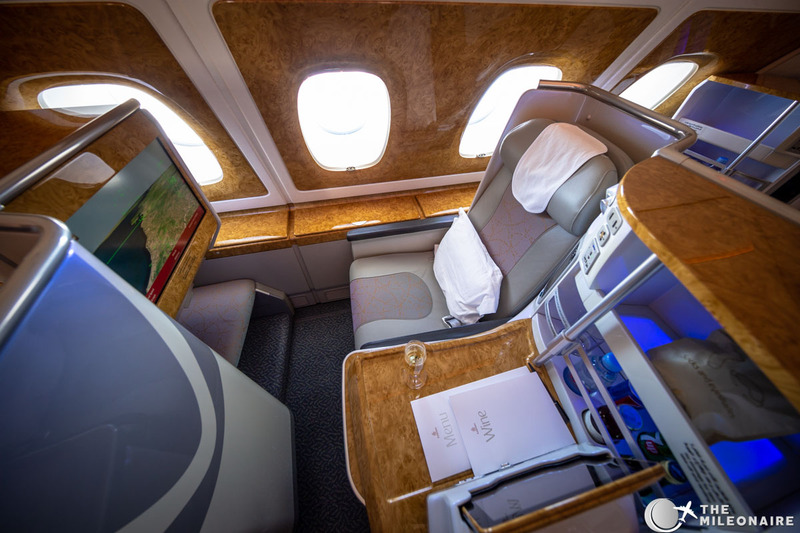 With this huge fleet Emirates serves destinations all around the globe from their Dubai homebase. 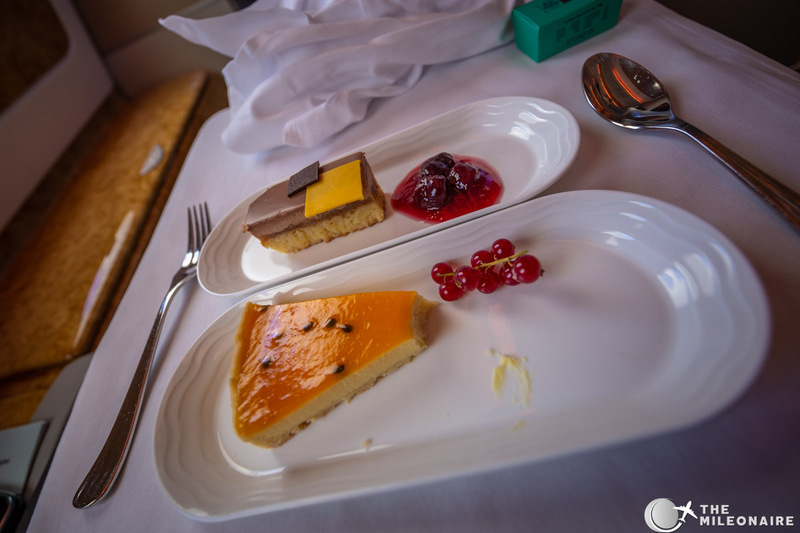 After my trip in Emirates’s A380 First Class last year, I now had the opportunity to try the Emirates A380 Business Class as well. 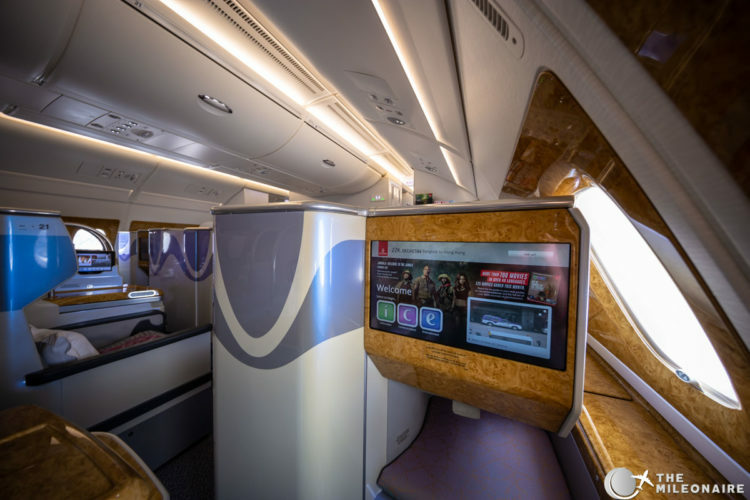 I flew a total of three segments (Paris to Dubai, Dubai to Bangkok, Bangkok to Hong Kong) in Emirates’ flagship and wanted to share my overall impression of their flagship product! 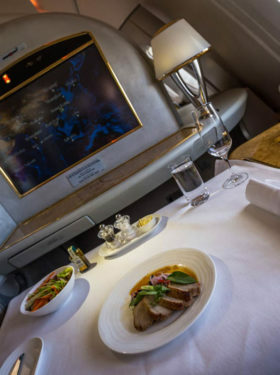 After relaxing visits in the Emirates lounges in Paris, Dubai and Bangkok (every single one quite enjoyable) I boarded the A380 through a separate entrance for Business- and First Class guests. 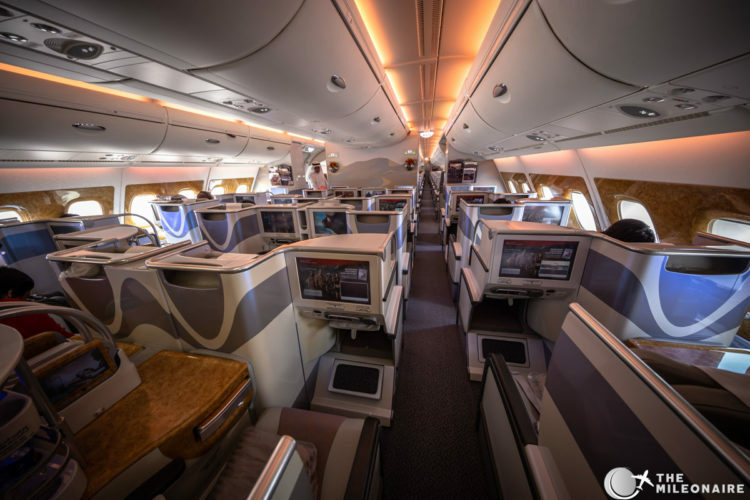 Despite different configurations (two class / three class, check out the seat map) the Emirates Business Class is always in the upper deck of the A380, divided into two cabins. One of them is pretty big with 14 rows, whereas the other one feels more intimate as it only consists of 5 rows. The bigger Emirates business cabin with 14 rows of seats. I always selected my seat in the smaller cabin, and I’d also recommend you to do the same. 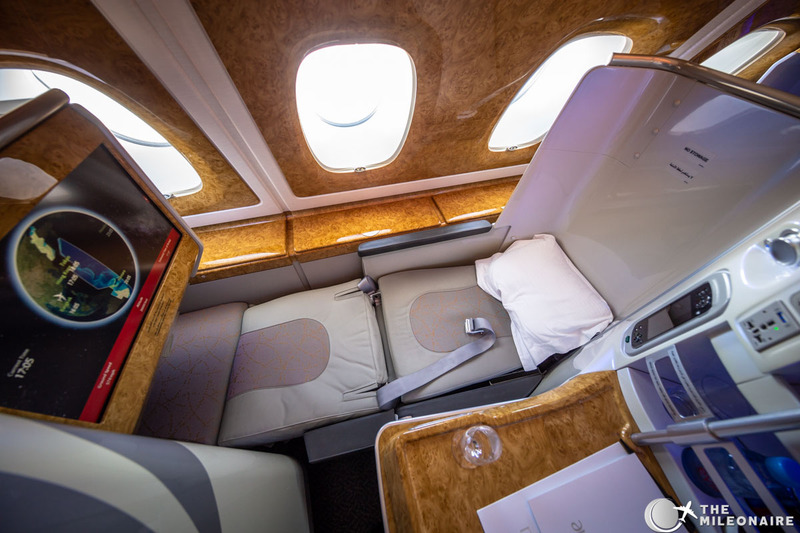 No matter in which one you’re seating though: the Emirates business class cabin in the A380 feels nicely bright and inviting once you enter the aircraft. Besides the dark blue carpet on the floor, all materials are rather bright: light grey plastic around the seats, grey leather and the typical wood veneer everywhere (which I’m not a huge fan of as it tends to look cheap at some point). Speaking of cheap, why on earth would you add additional layers in flip-flop blue onto the light grey seat housings? The cabin itself is fine visually, but things like these just feel cheap and out of place. 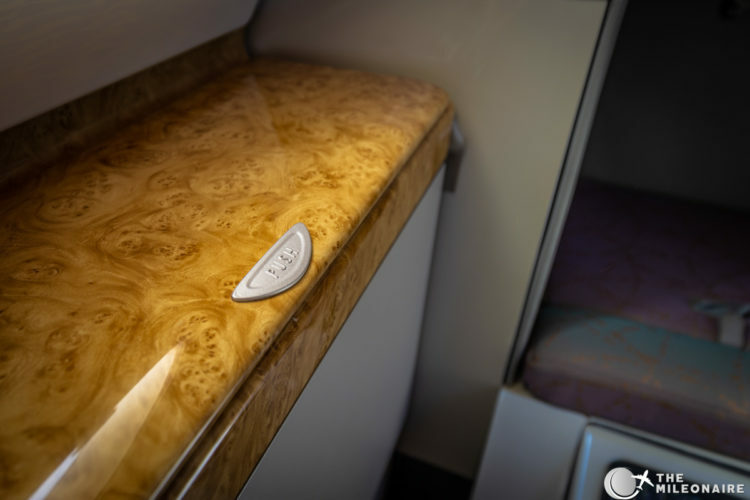 I personally prefer the more elegant and subtle design that Etihad implemented in their Etihad Business Studios. 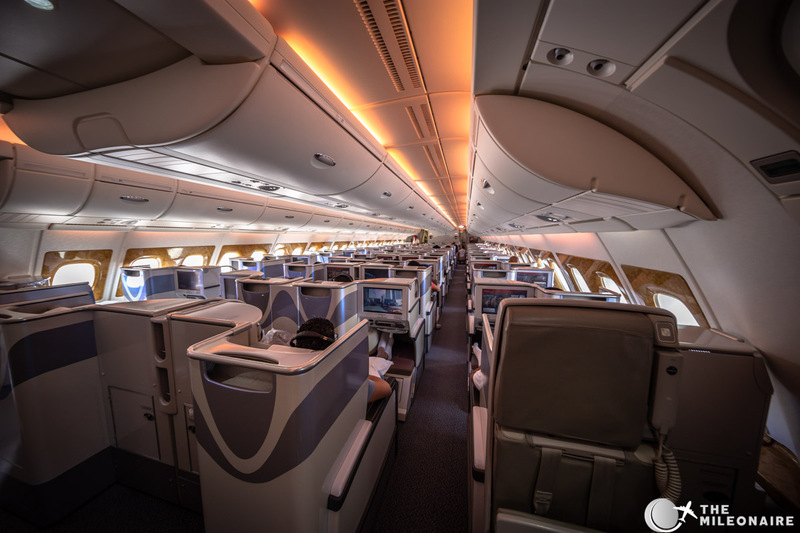 The smaller business class cabin with just 5 rows of seats. 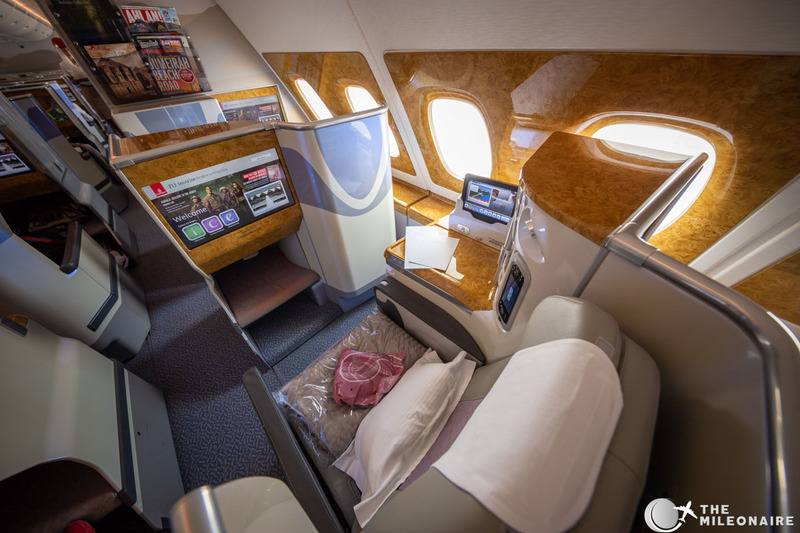 The spaciousness of Emirates A380 Business Class is exceptional though: despite the width of the A380 cabin, all business seats are arranged in a 1-2-1 configuration with only 4 seats across the wide cabin. This results in a lot of space for each seat, either in the single seats near the window or the double ‘honeymoon’ seats (especially seats E and F) in the middle. 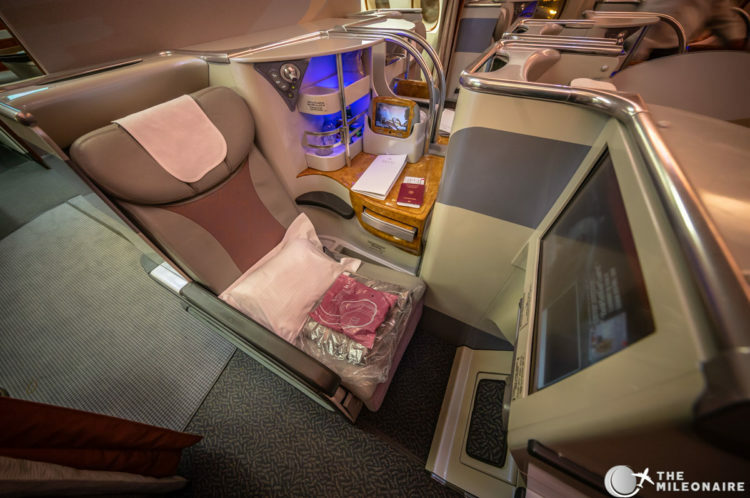 One important thing to remember: this only applies to Emirates’ A380 cabin, the Business Class in their Boeing 777 is way different with an inferior 2-3-2(!) configuration. 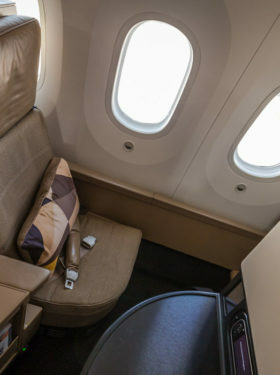 For me as a single traveller the seats A or K are ideal: these are the true window seats that also add another layer of privacy due to their layout (take notes Lufthansa with your constant 2-2-2 setup). Another big plus: every seat has aisle access, so no climbing over your seat neighbor anymore. 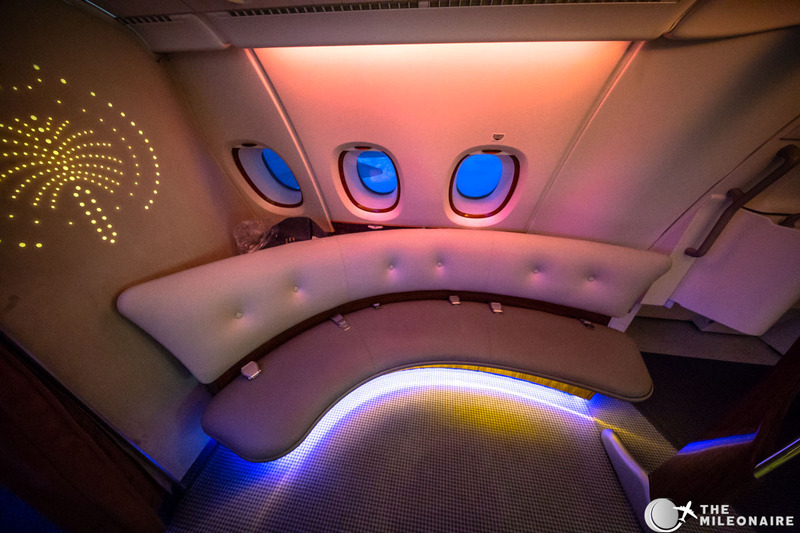 Another nice touch: In some of Emirates’ A380s there are no overhead bins on the sides, only in the middle. This also adds some more spaciousness to the cabin. Much more space: notice the lack of overhead bins on the sides. 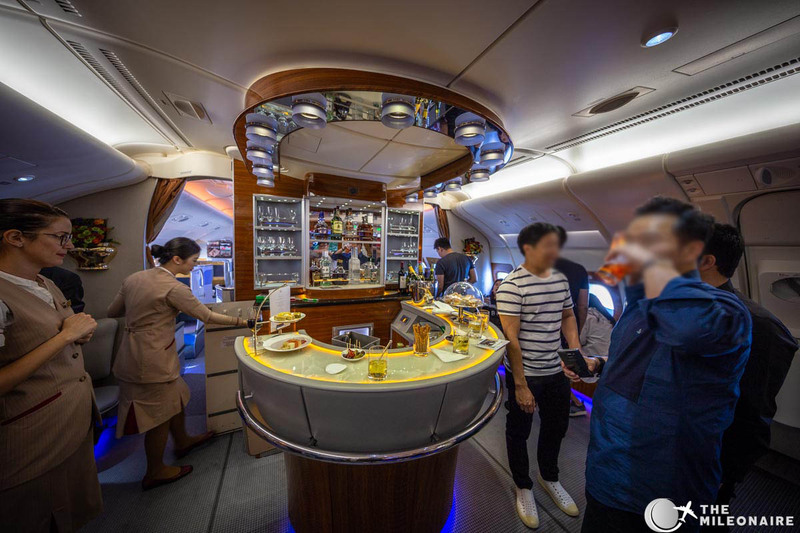 Depending on the route, the bar can be mostly empty or really crowded (especially on BKK – HKG). I think it’s a very nice touch though that Emirates does not just maximize the amount of seats (and revenue) in their A380s, but tries to think of additional ways to improve the onboard experience. 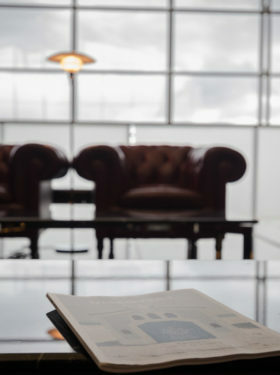 And – if you’re travelling with business partners, these bar areas allow a small business meeting without disturbing other guests. 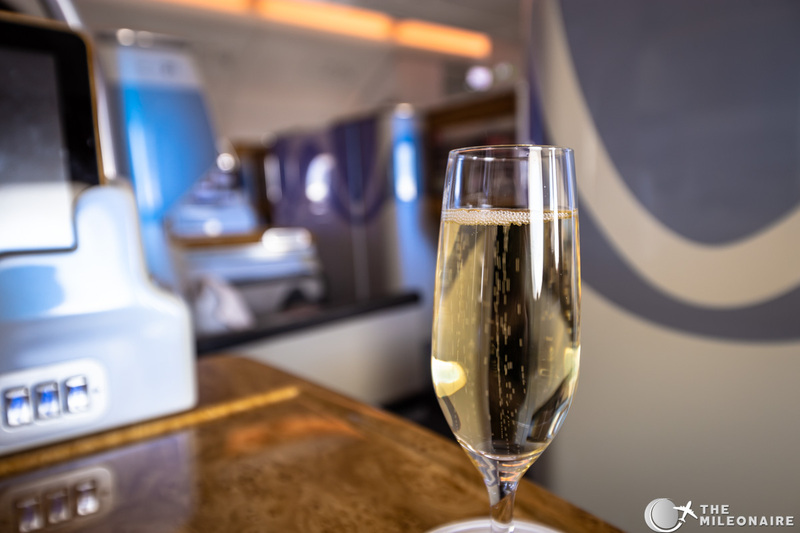 One small disadvantage though: the last row of business class seats in front of the bar can be a bit more noisy than the rest of the cabin. …the other seats feel a bit less private and smaller. Seat 26G: The proximity to the bar might be bothersome. 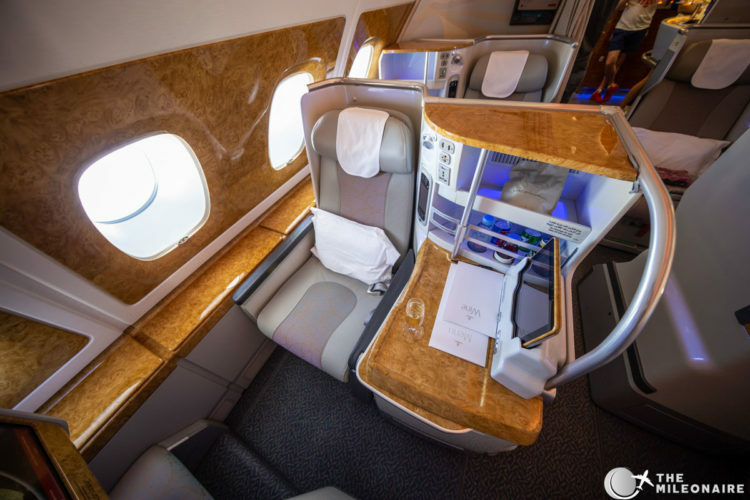 The difference in quality feels pretty big although it’s basically the same seat; that’s why single travellers should always try to get a window seat in the Emirates A380 Business Class. An ottoman in the foot area offers additional storage space for your shoes. Depending on the age of the specific cabin this foot rest can be a bit lower, so technically it isn’t 100% lie-flat. Still, it is way better than all angled seats in business classes worldwide. 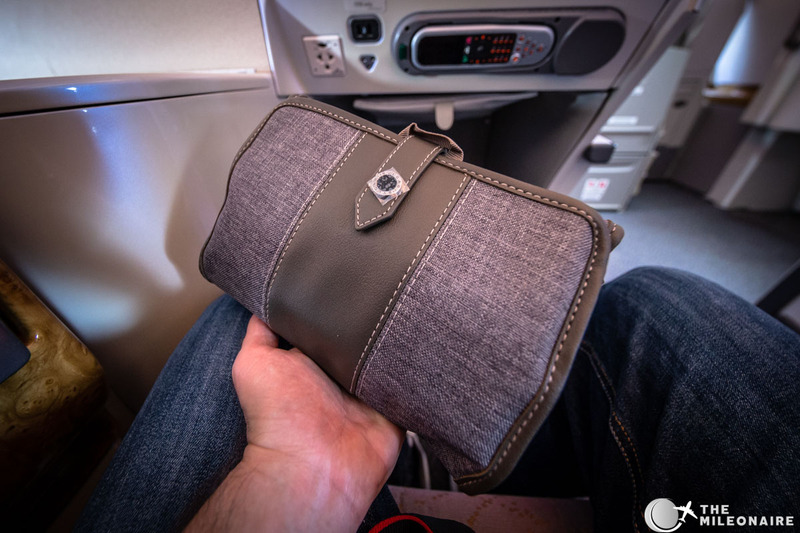 On the side you’ll find a couple of things to make your seat more enjoyable: there’s a small handheld to control the in-flight entertainment, plus a couple of ways to charge your devices (plug/USB). There’s also the control unit for the window blinds, as well as a bigger tablet to control nearly everything on your seat: IFE, massage options, lighting and much more. The tablet itself is very responsive and a pleasure to use, although I don’t really get the redundancy of having the handheld AND the tablet. 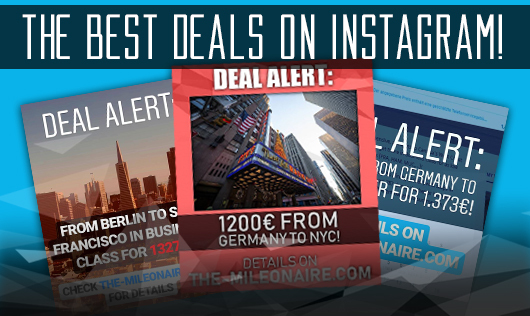 Everything at your finger tips: handheld, tablet and a minibar! The Emirates tablet in its docking station. 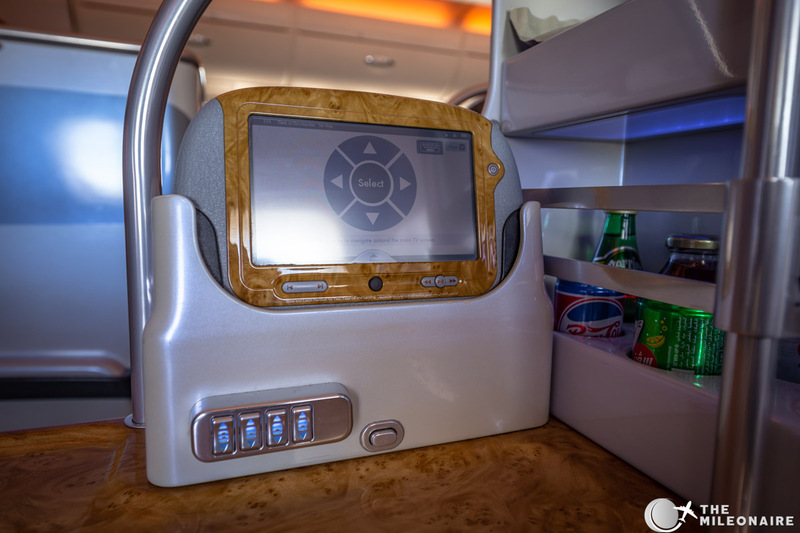 You will also find the typical Emirates minibar in that area. 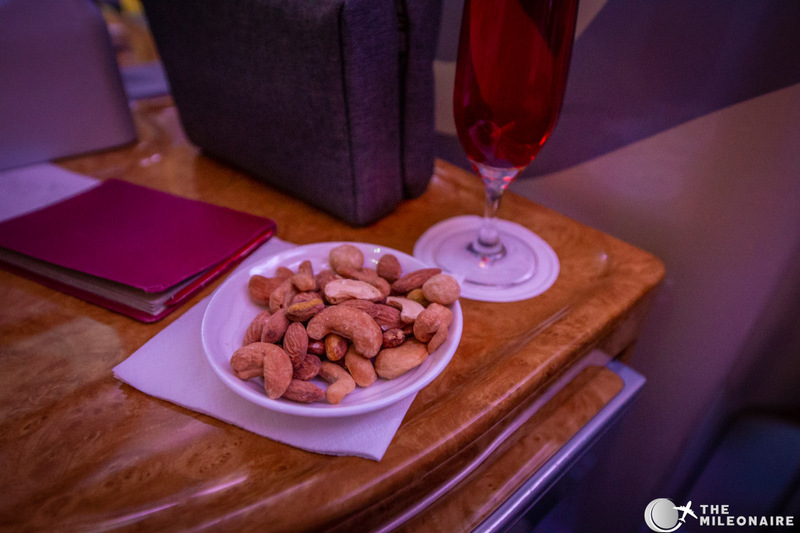 Yes, you have a personal minibar in your seat, similar to the Emirates First Class! There are various juices and softdrinks available, but they’re all at room temperature. 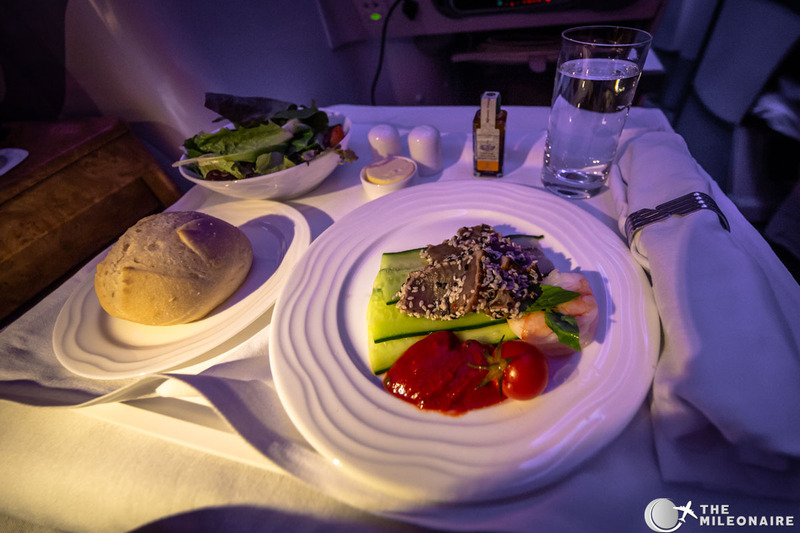 I rather think it’s a nice gimmick though, as you can order a cold beverage during most of the flight time from the cabin crew. 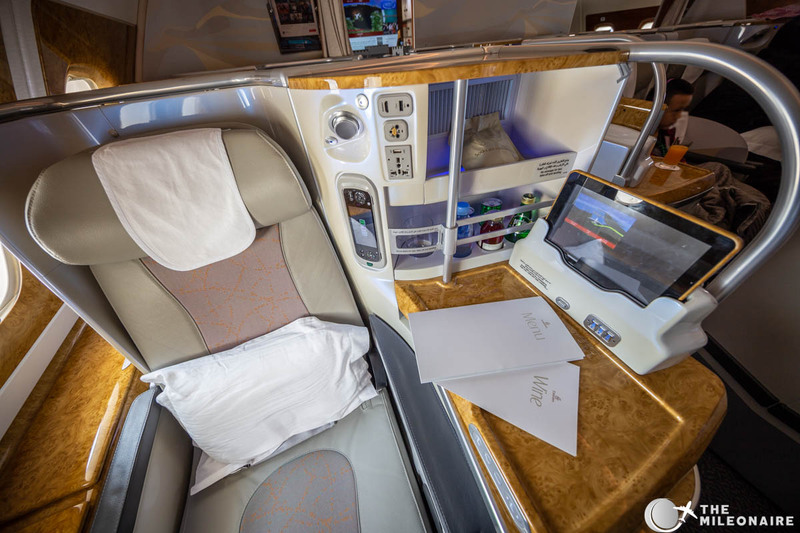 Opposite of you is the rather large screen with Emirates’ solid in-flight entertainment system. 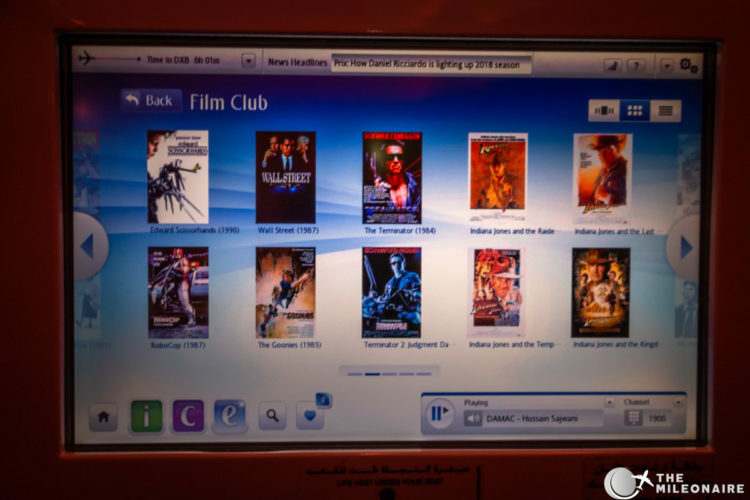 The screen is sharp and bright, and the IFE itself (called ‘ICE‘) offers a solid variety of movies (classics and new releases, also a selection in Arabic, Chinese or Indian), series and live programs. The Emirates IFE (called ‘ICE’) with a good selection of classics and new releases. All in all I really enjoyed Emirates A380 Business Class seat: the seat is perfectly comfortable in all positions, and feels very spacious with a high level of privacy. Despite some wear and tear on some of the older A380s, it still ranks highly compared to major competitors. Let’s move on to another traditional strength at Emirates: the on-board service! When boarding there are already some things waiting for you on your seat: a nice soft pillow, a blanket, a pretty good noise-cancelling headset, some socks and an eye shade. …and the food / wine menus. You’ll mostly have three different appetizers and main dishes to choose from, as well as four dessert options. The drink menu is impressive with a multitude of cocktails, spirits, mocktails and hot beverages. Besides champagne there are always 2-3 white and 2-3 red wines to choose from. Tuna Tataki, shrimp and tomato dressing. Lentil soup with Arabic bread. Roasted Chicken, filled with Olives. Beef Short Ribs, coconut braised. 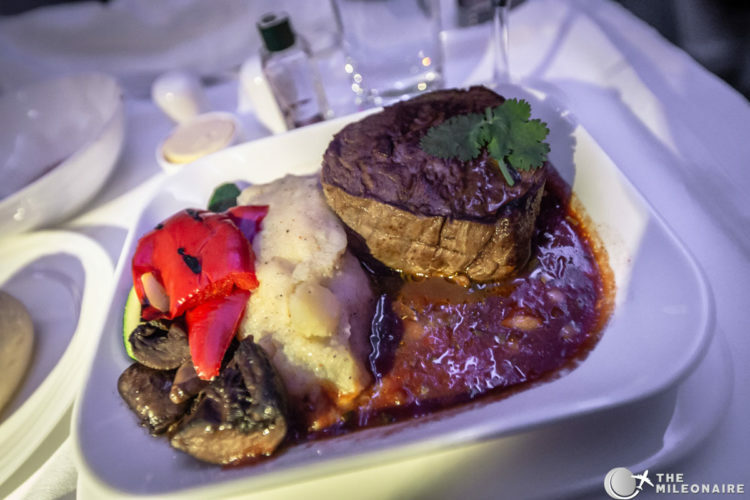 Tenderloin Steak with mashed potatoes. Chocolate cake and a passion fruit tarte. 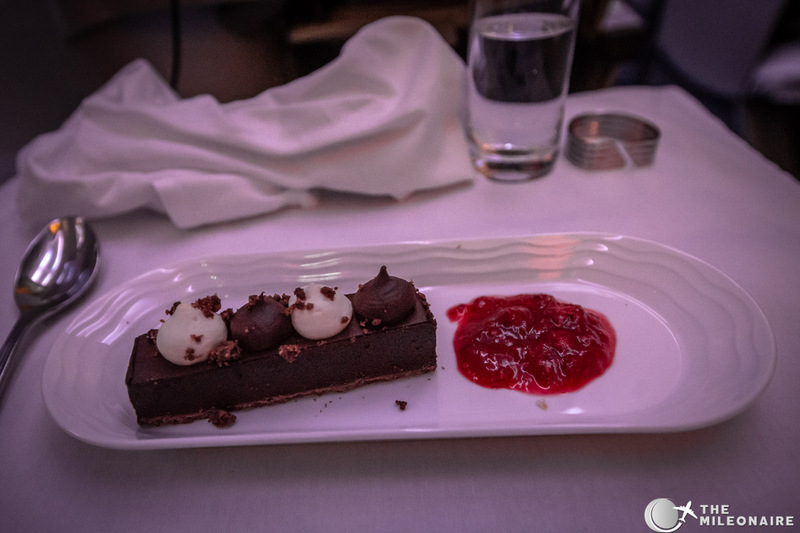 Chocolate delice with raspberry sauce. The well-trained crew had the right pace for each course, and I was always lucky to have very friendly and motivated crew members serving me. 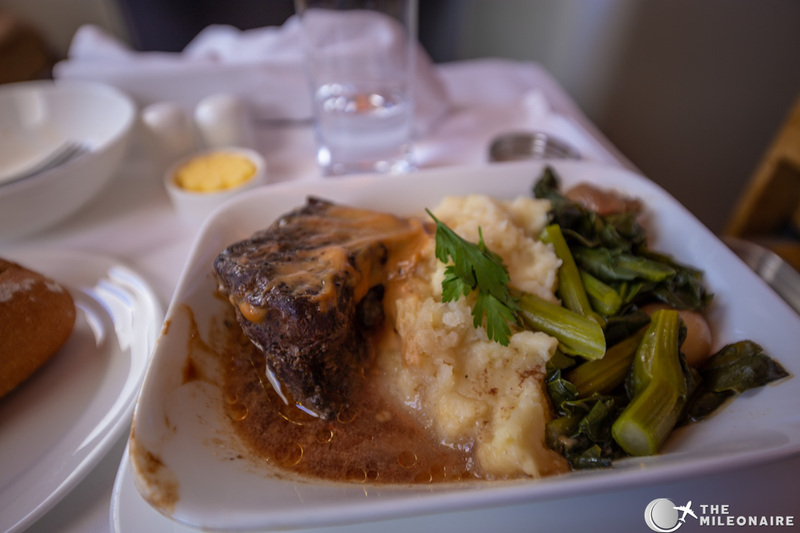 One example of the good service: I talked to one of the stewardesses about my camera and the photos I took with it. She immediately offered to check if there were any window seats available, so I could take better photos. Two minutes later I sat in a window seat, even without asking – that’s how proactive service should be. 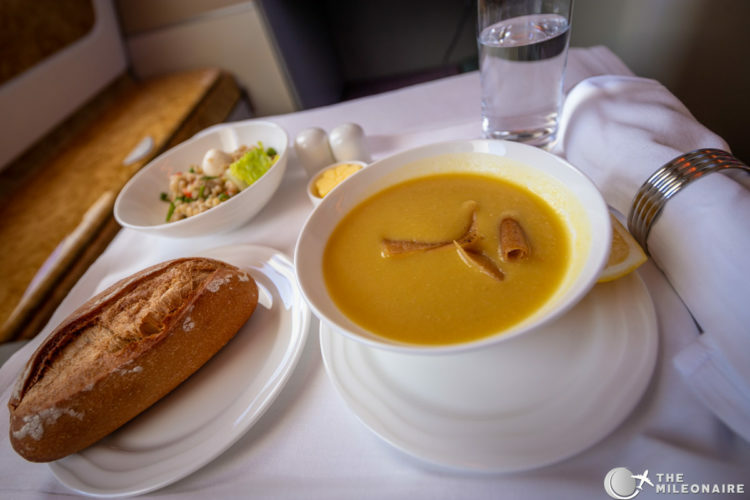 Can Emirates’ Business Class in the A380 justify the good reputation of the 5 star airline? The answer is a clear yes: even though some of the cabins start to look a bit dated, seat and service are top notch. 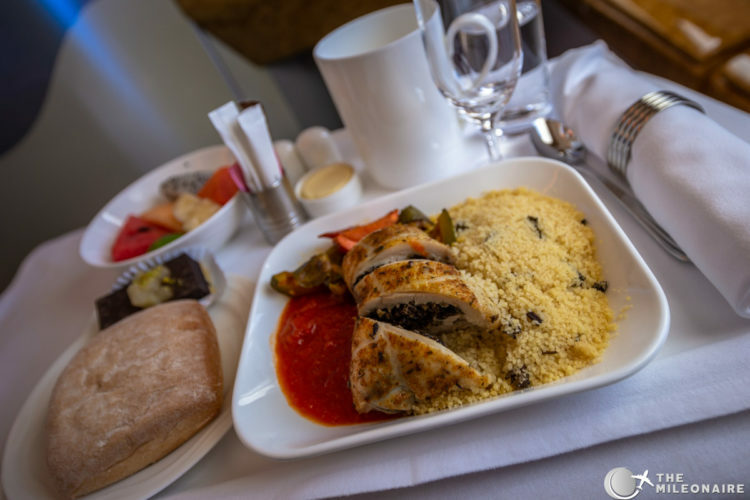 Great catering, excellent service, attentive crews and a spacious lie-flat seat with lots of privacy offer an on-board experience that can easily challenge some of the First Class products in the world. Especially when compared to the Boeing 777, Emirates’ A380 Business Class offers a marvelous flight experience.